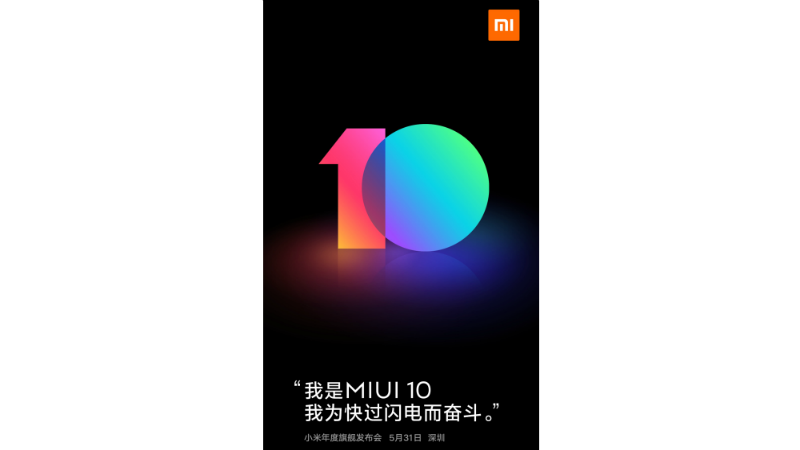 Alongside the Mi 8 flagship, Xiaomi has now revealed that it is launching MIUI 10 at its annual event on May 31. The new MIUI version, which was announced back in January, focuses largely on artificial intelligence (AI) and machine learning. It will replace MIUI 9 that was released in July last year and reached India through the MIUI 9 Global ROM in November. Notably, the company has already discontinued development for MIUI 9 to make way for the next MIUI version. Xiaomi hasn't confirmed which devices will get the upcoming MIUI, though we can safely presume its existence on the Mi 8 right from the day of its launch. As seen from a teaser image posted on the official MIUI Weibo account, MIUI 10 is claimed to be "faster than lightning". The MIUI 9 was notably launched with a tagline that touted it to be "as fast as lightning". This suggests that the new MIUI version will have some performance enhancements to deliver a better overall user experience. Moreover, the Beijing-based company previously stated that its next MIUI version will not support hardware based on Android 5.0 Lollipop. Alongside better performance, MIUI 10 is expected to come bundled with some new themes and an upgraded Settings app. The presence of AI within the interface and on the Camera app is also likely to make the new MIUI an advanced custom ROM for Android users. Likewise, the next MIUI will have new battery-saving features. It is also presumable that Xiaomi will announce the global availability of its AI-backed Xiao Ai assistant. Specifically for the Xiaomi Mi 8, MIUI 10 is expected to come with a proprietary facial recognition feature that may leverage the 3D face sensing module. The facial recognition feature could bring an experience similar to Apple's Face ID that is available on the iPhone X. While Xiaomi is certainly launching MIUI 10 at its May 31 event, the new MIUI version will take some time to reach your device. Historically, the company takes months to bring its new MIUI to older devices. That being said, you won't need to wait much if you're set to pick the Mi 8. As per some recent reports, the Xiaomi Mi 8 will be powered by a Qualcomm Snapdragon 845 SoC along with 8GB of RAM and up to 256GB of onboard storage. The handset could also have an under display fingerprint sensor. Besides, it is expected to run Android Oreo on top of MIUI 10.